Zoom in close and see the detail of the Fruit Fly. 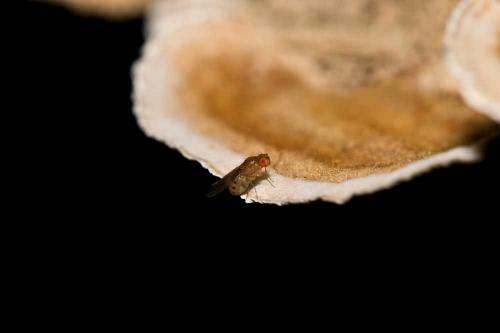 As is understandable, these flies are attracted to and lay their eggs on fruit. They develop in briny or vinegarlike liquids. These flies are not damaging, but hey are not just a nuisance but can be disease vectors. The adult females lay the usual 500 eggs near fermenting fruits and vegetables, with their eggs hatching out about 30 hours later. It is their larvae that will develop in the briny or vinegarlike liquids of fermenting materials where they feed near the surface and primarily on the yeast for about 5-6 days. The larvae will crawl to drier areas. Newly emerged adults mate in about 2 days. Their life cycle can be completed in 8-10 days at 85 F. Very prolific. You can see how they can explode in numbers in such a short period of time. A list of materials that they will be attracted to are endless. Bananas, grapes, peaches, pineapples, tomatoes, mustard pickles, potatoes, etc... fermenting beer, cider, vinegar and wine... sour mop and broom heads, fruit under a table or cabinet, fruit left out in a bow, drip pan of your refrigerator or freezer, etc... Dishwater and mop water full of food particles. So now you will know where to look to find the source of what to clear out or clean up. Copyright © 2019, Angeles Pest Control. 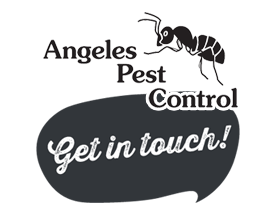 Angeles Pest Control Rated 5.0 / 5 based on 15 reviews.